Russell Wilson threw three first-half touchdown passes to lead Team Irvin to a 49-27 victory over Team Rice in the Pro Bowl on Sunday. 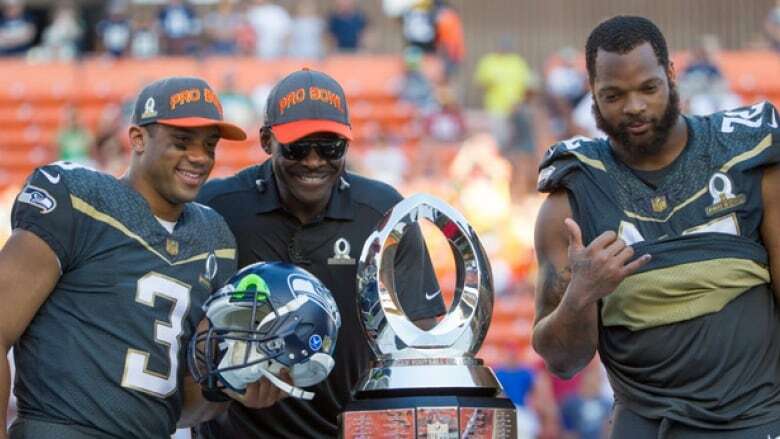 The Seattle Seahawks star, who was the first player picked in the all-star game's draft, led scoring drives on three of Team Irvin's first four possessions at Aloha Stadium. He threw touchdown passes of 14 and two yards to Atlanta Falcons teammates Julio Jones and Devonta Freeman, respectively, in the opening quarter. "To see us Seahawks out there is a real special thing," Wilson said. "It's a testament to our hard work and to see two Seahawks out there as MVPs is really cool." Wilson was selected the game's offensive MVP, while Seahawks teammate Michael Bennett was defensive MVP. Minnesota's Teddy Bridgewater and Tampa Bay's Jameis Winston each added two TD passes for Team Irvin. Jacksonville's Allen Robinson, Tennessee's Delanie Walker, Philadelphia's Darren Sproles and Houston's DeAndre Hopkins had scoring receptions. Kansas City tight end Travis Kelce caught two scoring passes for Team Rice. Miami's Jarvis Landry also had a TD catch, and Tampa Bay's Doug Martin ran for a score. Dominique Rodgers-Cromartie of the New York Giants had two of Team Irvin's six interceptions. After Kelce's four-yard reception from Manning gave Team Rice a 7-0 lead, Jones tip-toed the left sideline just after hauling in Wilson's pass near the back corner of the end zone for a 14-yard score. Freeman had five touches (three carries, two receptions) on the drive that culminated in his TD grab. The drive was set up by an interception by Dallas Cowboys linebacker Sean Lee off Manning. Kelce caught the second of his two TD on a 10-yard pass from Oakland's Derek Carr to cut Team Rice's deficit to 21-14. Team Irvin added a score late in the second quarter on a two-yard touchdown pass from Bridgewater to Sproles to hold a 28-14 lead after two quarters. The halftime festivities included a parade of local high school football players. Tennessee Titans rookie quarterback Marcus Mariota, a Honolulu native, led his alma mater, Saint Louis School, onto the field during the procession and was greeted by loud cheers from the sellout crowd of 50,000. It was the 35th time the NFL's annual all-star game was played at Aloha Stadium dating to 1980, and the third consecutive season that it has used an "unconferenced" format. A record 47 players declined to participate in this year's Pro Bowl, either due to injury or for personal reasons, or couldn't play because their teams are in the Super Bowl. Carolina had 10 players selected, including quarterback Cam Newton, while Denver had four, including defensive stars Von Miller and DeMarcus Ware. Wilson was the lone quarterback originally selected to participate in the game. "Any time you have the opportunity to play the great game of football, you take advantage of the opportunity," Wilson said. "Playing in the Pro Bowl is a special thing because to be able to see all the amazing players across the league, who are the best players in the world and to be able to play on one field together is a really, really cool thing." The game was played at in Glendale, Ariz., last year. The site of next year's Pro Bowl has not yet been determined by the NFL, although it does have an option to return to Hawaii.